On my design wall this Monday are these two star blocks which will soon be mailed off to Washington. These were my October blocks for our do. Good stitches circle. (Tutorial is here if you want to make some yourself.) 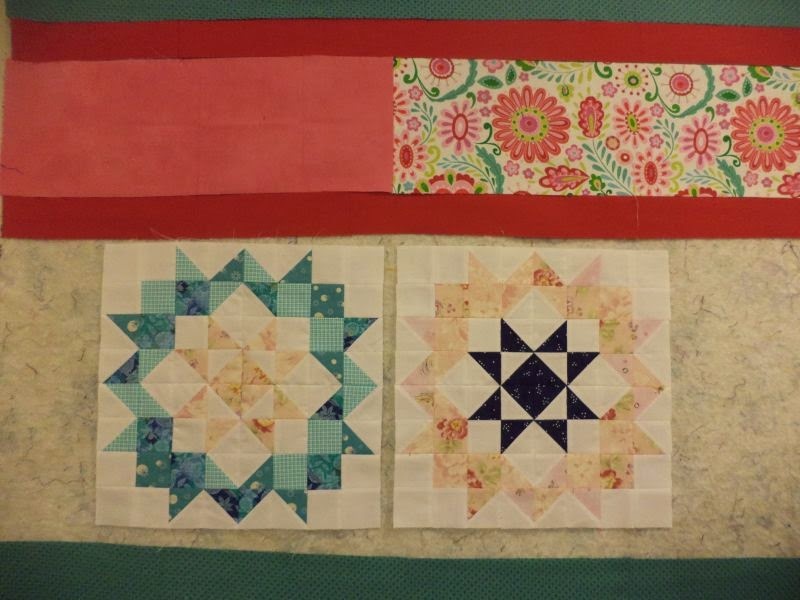 These blocks finish at just 12.5" sq and each one contains (64) 1.5" finished units, many of which are HSTs! So that was today's afternoon sewing. They look great, and I can't wait to see the finished quilt, but I am so glad I don't have to make any more of these! Friday I cut fabrics for the Fair Isle sew along over at Freshly Pieced, which was time consuming but not very photogenic. Then yesterday I started cutting and laying out fabrics for a new strip quilt (you can see the focal fabric above the stars in the pic above) but I didn't get anything sewn together yet. And tomorrow I have to go back to work :( Looking forward to Wednesday when I can sew again! Linking up to Judy at Patchwork Times. Love those stars!! Thanks for sharing the pattern link.